Metro Self Storage is a centrally located storage facility in the Orlando suburb of Narcoossee. Our convenient location and well-designed modern storage facility offers indoor climate-controlled storage units and outdoor parking for vehicles. Whether you need storage for cars, boats, RVs, motorhomes, jet skis, or motorcycles, we have you covered. We offer vehicle storage on a monthly basis including RV storage, and with ample lighting and 24-hour access you can retrieve your vehicle anytime night or day every day of the year—even on holidays and Sundays. Metro Self Storage is easy to find too. We are located on Narcoossee Road near Lake Nona. We proudly serve Southeast Orlando residents and businesses including Medical City, University of Central Florida, Ventura-Orlando, Union Park, and Narcoossee, and Lake Nona. 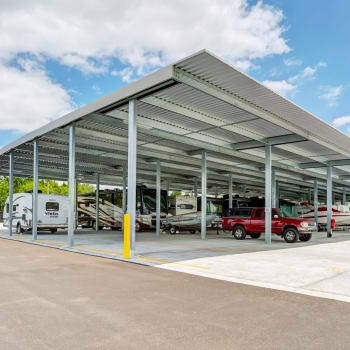 Whether you are looking for car storage near Orlando International Airport, boat storage in Lake Nona, or RV storage with 24-hour access, Metro Self Storage is the right choice for you. Our competitive pricing, easy to use online bill pay, and first-class friendly customer service makes the decision to store with us simple. We have plenty of room to store your car, boat, RV, truck, trailer, ATV, commercial vehicle, and jet skis. Call us to schedule a tour or reserve your parking space online with our free seven-day storage hold.